A box (350pcs) assorted moulding clip kit, includes 12 types to meet your demands. Made by high quality plastic, solid and durable. Great car accessories, commonly used for fitting side skirts, bumpers and other trim. 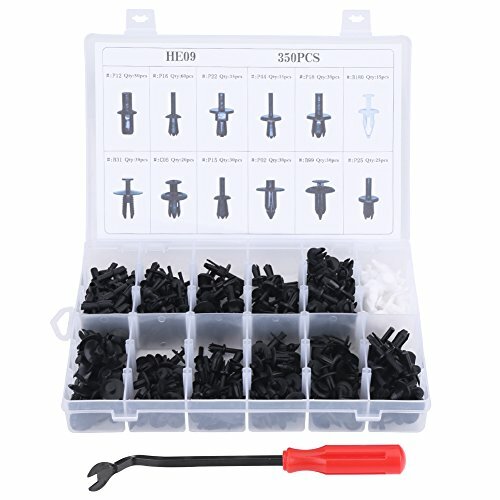 All pins and rivets are packed in a storage box which designed with separated space for each specification tool, convenient to select and collect. Screwdriver is included for easy installation and disassembly. Perfectly replaces the original bumper fastening clips, which tend to break during disassembly. Universal for most of car models such as for Volvo, BMW, GM, Ford, Toyota, Honda, Nissan, Mazda, Chrysler, Volkswagen, Mercedes Benz, Audi, etc. Box Size(L * W * H): 27.2 * 17.5 * 4.5cm / 10.7" * 6.9" * 1.8"
Screwdriver Length: approx.22.5cm / 8.6"